Inline bearings are essential and the most important component of inline skates. They have a significant impact on the quality and speed of the ride. The quality of an inline bearing, manufacturing accuracy and tolerance is examined by the ABEC standard. However, this standard does not speak to the materials used in the manufacturing process of a bearing nor the measure of "smoothness" that it will provide to your ride. Nowadays the most commonly used materials for the manufacture of bearings are chrome and carbon. What is the ABEC Standard? the higher the number, the higher the degree of precision used during the manufacturing process (this translates into greater longevity). distinguished in size by odd numbers printed on the bearings (3, 5, 7, 9). ABEC 3 is used for low cost or junior in-line skates while the most widespread are ABEC 5 and 7 bearings. For sports that require a faster bearing, the ABEC 9 is the best quality. ILQ is a standard of measure used by K2 . This is a series of new premium quality bearings. The level of precision used in the manufacturing process is so high that these bearings are on a level of their own when compared to the ABEC series. 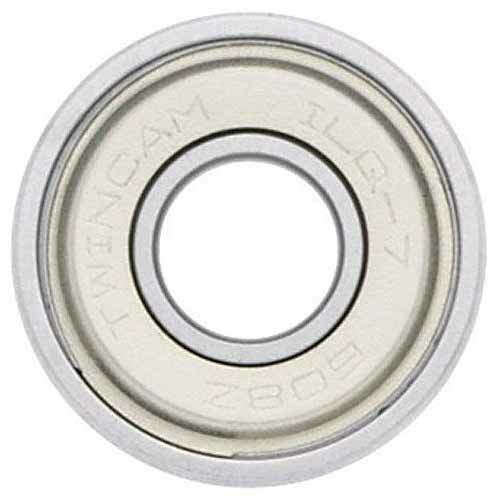 The use of highly resistant steel balls inside the bearing and a special gel, requiring virtually no maintenance, puts ILQ bearings leaps and bounds ahead of the competition. SG (Speed Grease) is a standard used by Rollerblade. This brand of bearings was created to introduce their customers to the significance of using quality components in Rollerblade brand skates. SG bearings promise long-lasting durability with the aim of differentiating Rollerblade from its competition and offering an alternative to the ABEC standard.